Who started the Facebook group? But who ever did that did a wonderful job of creating and cementing relations. As we crossed the gates of Great Lakes, we were not going into an exodus of random people. Instead we were seeing live versions of the photos we had seen and stalked. We knew people, we knew that they were our friends. The virtual friends got down into the physical space of their bodily existence and then began a saga of a journey called MBA. We danced, crawled on our knees, learned salsa and let go off our inhibitions. We learned eating food at the stipulated times. Sloshing sambar onto their plates were the roti clan. The sadam clan relished their breakfast with aloo parathas with melting makhan on top of it. We learned to adjust. We learned to live. We learned life. We made friends. And as they say, we earned some friends too. Life was never made easy. But with friends, we just could get going. From bath attached rooms, we graduated to common bathrooms and queuing to finish off the business. We brushed and talked at the same time. Our roomies doubled up as alarm clocks, always ensuring that we went to the 8 am classes. As one term went by, we went home and but were eager to be back with our Wolfpack. The goodies from the homes were shared, We ate khakras and banana chips side by side. We munched on the namkeens and devoured the pedas and rosgullas. We savored ethnicity. We understood the nation's palette. We were the future of India nestling the souls from different parts of the country, yet kindling the soul. Well, that was a bit of context. Thats for now, and more to follow. Well, 2 years before today, we all were sitting on the couches squatting flies with our CAT score card and gleaming at a seemingly bleak future that lay ahead. Some of us had dropped a year to bell the feline beauty of the Felis family. Most of them were either on the verge of getting their celebrated pink slip or being cracked open by insanity, thanks to harm done to the mankind by coding. As our thoughts resurfaced, we understood the plights we were going through.We were distraught with our wallets gone lighter by the day. We seemed to know the post office guy by his first name because of the sheer number of envelopes we’ve posted (to B-schools of course) Those who were bad in remembering numbers knew their credit card number by heart as they keyed it in numerous time a day. And then were days of preparing for GD/PI process, booking tickets to travel around the country not only for the process, but also to explore the vastness and diversity the nation had to offer. The GD/PI process brought in copious amounts of mind numbing and stressed moments. As the B-schools started issuing offer letters, those lucky ones were running helter-skelter to get opinions about their calls. The selection was followed by queuing up in front of your bank manager for a loan. No ‘yeh’ form, run back to home and get it. No ‘woh’ form, run back to the municipal office, bribe the clerk and get it signed by the officer. Seeing the prospect that you would be a big shot and pay up the loan in no time or the possibility that he could be reporting to you in the future, the loan was approved despite making you run. Great Lakes, yew... Is there a b-school like that? Great Lakes.... aww.... Nice name? Where is it? Great Lakes.... Omg! You got through Great Lakes... Well, no one said that! Well, Great Lakes, hell yeah. Here we are! Jilla explored the hearts of the masses only to excavate high hope-dipped disappointment. With 2 stalwarts adorning the crest of the movie, the story should have been crafted for sheer exuberance of talent. 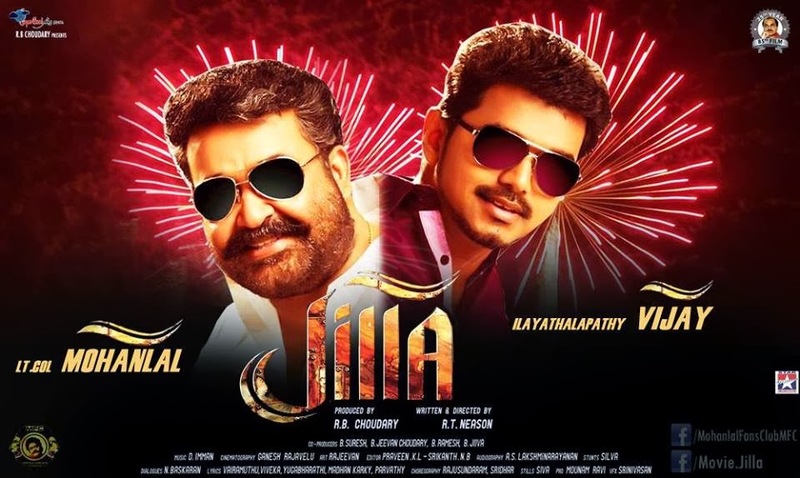 Jilla depicted how talent of the Indian pinnacle of acting, Mohanlal was wasted to its core. With too many songs and many uninteresting sequences, the movie undertakes a vicious cycle of events, a never ending loop of unnecessary stuff. Illayathalapathy Vijay was impressive with his charming smile but nothing out of the world. His acting seemed just way too common, the mass masala flavored one. His timing and flair for comedy has deteriorated over the years. Neason's attempt to portray the policeman Vijay was nothing but sheer mockery for the whole police force. With the transformation to show what a police officer ought to be, Vijay's mannerisms shows how a police officer should not be sans the sanctity of his mission. Smoking and abusing was what Mohanlal's role confined to. Portrayed as a don, Mohanlal's Shiva would have opened doors of classic acting to Tail cinema, had the script had a better yielding character for him. A clear deviation from the Georgekuttys of the world, the paradigm shift of Lalettan from Dhrishyam to Jilla calls for utter disappointment for him to have chosen the script. Kajal Agarwal was pretty on screen showing less skin and more khakhi. Merely used as a pretty prop to extend the duration of the movie, she was either seen making faces to Vijay or sporting that smile. Of the other actors who shared screen space with the trio, antagonist Sampath steals the show with a small but effective portray of ruthlessness. Soori was cracking witty remarks that failed to induce nothing more than a curve of lips. Direction, editing, songs etc. etc. has nothing to boast about. Too many songs spoiled the mood as the movie, if devoid of its extensions could have well be curtailed the movie to less than 150 minutes. Verdict: A mass masala movie for Vijay fans. Expect nothing during the 182 minutes inside the theatre- then its Paisa Vasool. Did we just think that the rain got lighter? And that was the reason that we went out of the comforts of the restaurant we dined and left the shades and powered the lifeless unicorn. Within the 1st minute of riding, I could feel my teeth chattering with the icy cold downpour over our heads. My breath was going in and out deeply with the chill creeping up my spine. I could feel my heart beating against my Adam's apple. I could barely breathe as the chilly water droplets were taking its toll. . My eyes went to the auto-tightly-shut mode and my body curved to expose to the minimum amount of rain. We were drenched head to toe and were shivering. By the time the bike gathered speed, I could feel the rain letting its might on us with pins and needles poking us, faster the bike, higher the prickles. Soon, whole drench made us rebellious to the after-rain-side-effects. I suddenly started getting warm. My eyes were slowly opening and was auto-focusing to the pitch darkness, erred at times by the oncoming headlamps and the electrifying lightning. Every turn was to be made with utmost precision and care. I was just thinking of the same-name-but-tirelessly-worked-up rider who braved all the hardships and was valiantly riding to the destination.